Due for release in March 2017, I have to thank NetGalley for giving me the opportunity to read Cat Clarke’s first journey into middle-grade writing prior to publication. A heartfelt, entertaining and thoroughly recommended read. Liv (Olivia) is Transgender and has always known that, at heart, he is meant to be a boy. He hasn’t told anyone of his thoughts, and his voice immediately grabs our attention and has us rooting for him to come through what life throws at him unscathed. Our novel begins with Liv about to start middle school. This is daunting enough, but Liv is horrified by the strict dress code that his new school enforces as it means he has to wear a skirt. His best friend – who suddenly isn’t as keen to be seen with him as she tries to ‘get in’ with the popular girls – is increasingly distant and, once his new classmates learn he has two mums, Liv becomes a target for bullying. As I read I have to say that I could predict some of the incidents that took place. Perhaps this is inevitable given the target audience for the novel. 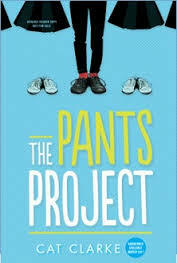 In spite of this, ‘The Pants Project’ reminded me of novels such as ‘Wonder’ – full of charm, earnest in their message but ultimately uplifting. I cannot wait to see what students make of this.